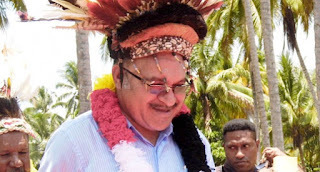 PRIME Minister Peter O’Neill has told a group of leaders from the public and private sector that he is confident of returning to power and continuing his government’s education and health policies. He told this year’s Leaders’ Summit – a conference attended by Cabinet ministers, senior civil servants, community and business leaders which he started in 2013 –that the people had witnessed the services provided by the Government. “It is no doubt that we have laid the foundation over the past five years,” the prime minister said. He told participants at The Stanley Hotel in Port Moresby that he was confident the people would put his government back in power. “Me and my colleagues (Government MPs) will be seeking endorsement from our people whether we continue in our jobs or not,” he said. “And I want to thank the parties for supporting the Government for the last five years. “It was a challenging five years where we have received heavy criticisms – some of them warranted and some not. “But our people will make their choices and I know they will make their judgment for the sake of stability. O’Neill said they invested K3.5 billion in education and put more than one million children in schools. O’Neill said the State had invested K6 billion in the free health care policy in the past five years.